According to renewable energy industry magazine Recharge News, Samsung Heavy Industries is pulling back from activities in the offshore wind sector while it undertakes a strategic review. The turbine, Samsung’s flagship project in the sector has a 171-metre diameter rotor sporting 83.5m SSP Technology blades and was assembled at Fife Energy Park. The turbine generates enough power to run 4,800 homes. Although Samsung made rapid progress with the deployment of the prototype it is thought that the competition in the sector is very fierce and Samsung would need to defeat formidable rivals in order to generate the orders needed to make a significant impact in the European Offshore wind sector. 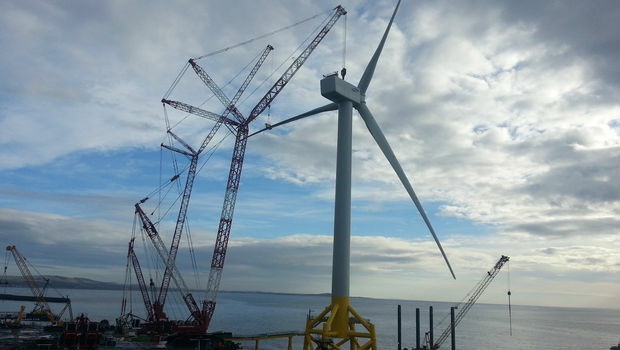 This has been an experiment on an epic scale by Samsung with £70 million invested in the project so far and the world’s largest wind turbine standing 50m off the coast of Methil.